Learning to program Arduino in the open. 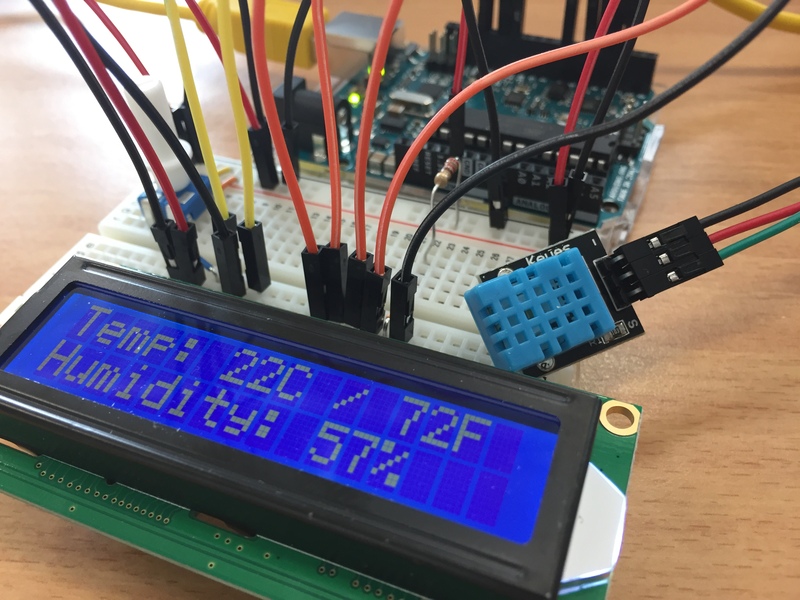 Showing real-time temperature and humidity data on a liquid crystal display. My friend Afra invited me to participate in a conference in Sweden involving sustainable urban greenhouse solutions. Så Ett Frö (Plant a Seed) is a collaboration with HSB Living Lab, a 10-year-long experiment which uses technology to help build more sustainable housing building. My job was to automate a small greenhouse using my budding Arduino skills. The main objective of Så Ett Frö is education amongst grades 7-9. So for now we haven't spent time calculating economic value or carbon footprint. Future iterations will hopefully allow us to tackle these engineering issues which will make the greenhouse more sustainable. I've already used a soil moisture sensor so my first assignment was to integrate a temperature/humidity sensor into the greenhouse. We used the well-known DHT11 because it was available everywhere and there are two good libraries for reading data from it. The setup is as simple as can be. VCC, GND, and a SIG are all the connections you need. In order to report both temperature and humidity, the DHT11 sensor outputs a stream of 40 bits so there are libraries to help read the raw data off whatever pin you connect. That means you can plug SIG into any pin, analog or digital. We waited until setting the LCD up to choose a pin. Once you're at the library manager search for SimpleDHT. Install the latest version so it's available to the IDE as an include (more on that later). We had an LCD from the Arduino Starterkit, a backlit display with two 16-character rows. I'll skip the connections because we followed the official LCD connection instructions without making any modifications. If you follow that tutorial you should be good. Our code below uses the pins in that tutorial, in case you're wondering about the numbers supplied as parameters to the lcd() initialization below. You'll notice the official tutorial includes a potentiometer (a knob). It controls the contrast of the display. If it's unreadable give the knob a twist and find the right setting so the characters are easy to read. While wiring our display, we tried to make it "easier" by omitting this component... it made it more difficult in the end. Be sure to include it! After connecting everything for the LCD, we chose digital 6 for our DHT11 signal since it was still available, and lining up all the pins next to each other makes adding additional components easier. We did a quick Serial Plotter test to ensure everything was working correctly, and then wrote the following code to send the data to the LCD. // Create variables for DHT sensor output. // Delay 1 second because DHT11 sampling rate is 1HZ. The code is pretty straightforward. I'll highlight a couple points that were not obvious to the newer coders involved with the project. The #include statements at the beginning reference libraries available to your Arduino IDE. Remember when we installed SimpleDHT before using the IDE? The include statement won't work unless it was installed beforehand. The LiquidCrystal library comes pre-packaged with the Arduino IDE, so that include statement doesn't require a download beforehand. The dht11.read() function doesn't return output. Instead, the & symbol in front of &temperature and &humidity means that the variables are passed by reference. That is, instead of returning new values, the read() function alters the variables we supplied. This can be destructive, but since each new loop resets them to zero, this simple code doesn't have the possibility of data loss. The LCD's setCursor command is zero-based, meaning the 16th column is 15 and the 2nd row is 1. So the top-left would be setCursor(0,0) and bottom right would be setCursor(15,1). We attempted to use the degrees symbol for the temperature, but the display output other characters instead. The symbol does happen to be in the display's character set, but it's good to be aware that the display doesn't contain all the modern conveniences that make text so easy to render on a word processor or web page. We noticed when the readings dropped to single digits that the last character in the display seemed to be printed twice. But they aren't, the real issue is that when the shorter string is printed, it doesn't automatically overwrite the previous string. Adding a lcd.clear() caused a small but noticeable blink in the display, so I opted to pad the output with spaces in the case that the readings change from double to single digit. This solves the visual glitch while maintaining persistence for the static labels on the display. After everything was connected and running properly, this is what we saw on our display. We tested that it worked by cupping the sensor in our hands and blowing into them. Human breath is warm and humid so the numbers should both go up after a few breaths of air. Each character of the LCD is actually a 5x8 matrix of booleans. That means you have 40 bits that you can manually draw within each character if you're so inclined. 40 bits x 16 x 2 = 1280 bits total. If you are willing to sit and hand-code a drawing, you can make a fairly high-resolution picture. You could also make manual drawings of any character you want if it's not included in the default character set, then just reference them using variables. The display has a decent refresh rate, so you can achieve a few levels of brightness by redrawing a few times per second. But like all LCDs it has some "memory" between each pass so don't expect the same amount of precision that you can achieve with PWM on a LED.